Goodbye Da Beard…hello Brett Keisel! The Fourth Annual Shear Da Beard event, to benefit The Division of Pediatric Hematology/Oncology at Children’s Hospital of Pittsburgh UPMC was held tonight at Jergel’s. The event was SOLD OUT and Da Beard Nation packed the place! It was great seeing how many of Brett’s teammates, coaches and friends made time to support this wonderful cause! 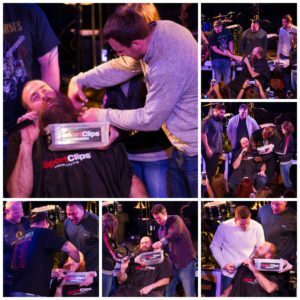 Shear Da Beard sponsors include: Da Beard Gear, SportClips, WDVE, Diehl Automotive Group, The Pittsburgh Steelers, Children’s Hospital UPMC, Hillmon Appliance Distributors, Don’s Appliances, Eat’ N Park, and PNC Bank. We will have MUCH more news on the event soon! Thank you once again to the great staff and management at Jergel’s Rhythm Grille for hosting Shear Da Beard!